Misc eatdrinksleep is a lovely little hotel hideaway located on the Kloveniersgburwal, close to the picturesque Nieuwmarkt Square, in the heart of the historic city centre of Amsterdam. We are proud to be located on one of Amsterdam's older canals dating from the late 1400's. This modernized 17th-century canal house features six personally styled hotel rooms. Each is a unique mix of style, charm and practicality, and overlooks either the canal or a fetching Amsterdam secret garden. We offer exceptional hospitality for the cultural pilgrim, the hopeless romantic and weary business traveler alike. Misc eatdrinksleep is a unique canal house hotel with appealing rooms that become a home in Amsterdam for our guests. Breakfast is included with the room and is served from 8:00 am until 11:30 am. 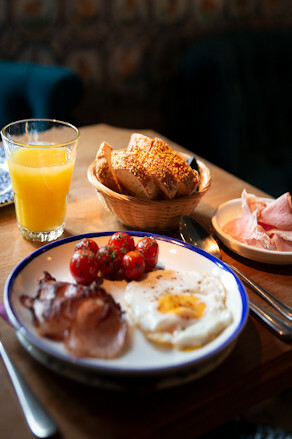 Our freshly prepared breakfast includes croissants from the oven, different types of country-style bread, Dutch artisan cheeses, butcher's cut ham, an egg (any style), bacon, muesli, granola, yogurt, milk, fresh fruit, fruit jams, fruit smoothies, fresh orange juice and tea or any style of coffee. Gluten-free options or any other style breakfast are available upon request (at least 24 hours in advance).